Since we want to show the effect of flank diffusion we focus on a spot where a standard internal wall penetrates the vapor barrier layer. The internal wall consist of standard bricks with a 15mm lime-gypsum plaster on each side. Although being widespread this setup is disadvantageous, as the bitumen layer prevents drying of the insulation layer towards the outside. Moisture that penetrates into the roof either by flank diffusion or by structural damages of the vapor barrier accumulates as the drying potential of this structure is poor. In this examination we decided to use the monthly averages for Austrian climate defined by the relevant standards. Of course any reasonable set of data can be used for this purpose. HTflux very clearly shows the effect of flank diffusion. Water vapor penetrates the plaster layer and the bricks to bypass the vapor barrier. The level of diffusion depends very much on the diffusion resistance of the materials used. In this case average values have been assumed for all materials. HTflux also reveals that the thermal bridging through the rafters in combination with extra insulation layer behind the plaster boards causes further condensations spots on the internal side of the vapor barrier. The condensate being formed inside roof sheeting is problematic as the drying capacity of this structure is poor. Most of the moisture can only leave the roof towards the inside (by flank diffusion again). In the present case this can only happen during four months of the year. During this period indoor humidity is elevated and the temperature difference between the roof sheeting and the internal air is low. Hence the rate of diffusion is low and the drying of the condensate accumulated during the cold period cannot be completely dried. Further accumulation of moisture with consequential damage is likely. 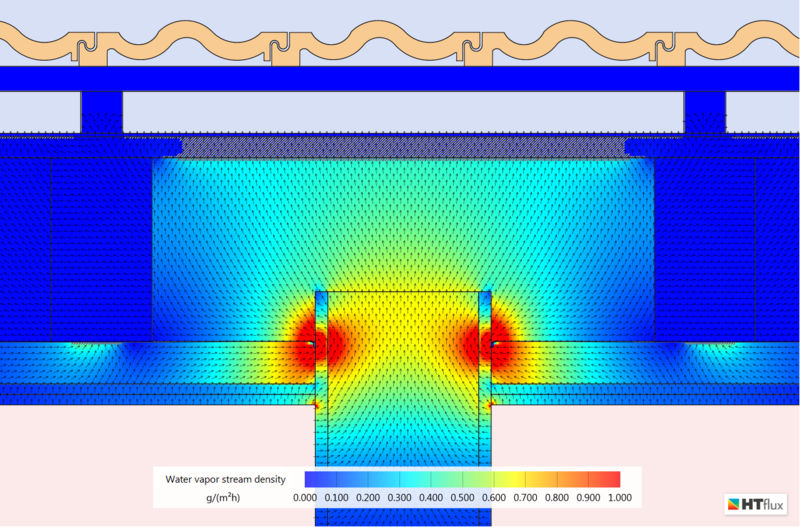 The simulation basically only requires the knowledge of two constant parameters per material: thermal conductivity (known as λ) and water vapour diffusion resistance (expressed as µ or sd-value). These values are usually well known or can easily be found on test certificates or the relevant standards. Forming the basis of the standards for hydrothermal assessment the Glaser method is well known and proven over decades. 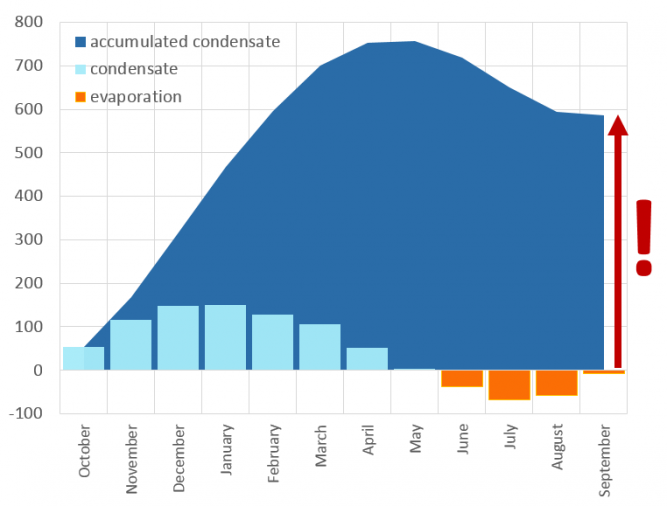 It provides a conservative method to calculate if and how much condensation can be expected. The results of such an assessment are therefore on the safe side as long as vapour diffusion is the dominant process. The method as well as its results are straight-forward and graphic. The method calculates the so called stable solution of the underlying differential equation. Keeping this in mind it is still possible to process a series of simulations (e.g. with monthly temperature averages) once interpreted correctly. On strong formation of condensation the method is less precise as moisture storage, liquid transport processes and moisture dependent change of material parameters are not covered by the vapour diffusion model. In such cases the amount of condensation is usually calculated too high, whereas the evaporation potential is underestimated by the model. Again, this represents a safe side assessment that can point out the need for a closer examination. A more realistic simulation including liquidity transport and moisture storage would require a precise knowledge of the often complex temperature- and humidity-dependent parameter functions of all materials used. This information is often not available. Therefore we believe that the GLASER 2D method offers an excellent and sometimes even the only practical way for hydrothermal assessment of two dimensional details – providing precious information with little effort. Note: You are permitted and encouraged to use images from this page or to set a link to this page, provided that authorship is credited to “htflux.com”.